The guy who recreated Super Mario Bros. as a first-person obstacle course is back with an augmented reality take on another classic game. 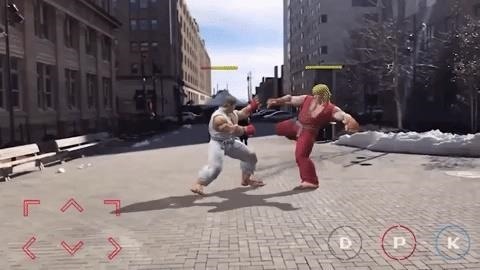 While the previous experiment was built for HoloLens, this time the developer, Abhishek Singh, has come up with an AR version of the classic Street Fighter II for mobile devices like the iPhone and iPad. A demo video shows that the game can be played on a tabletop with miniature fighters or scaled up to life-sized so your champions can fight on an actual street. Singh used ARKit to allow him to anchor the content to any horizontal surface. The coup de grâce of the recreation, though, is the multiplayer mode. "I used Unity's networking system and some clever hacks to get the multiplayer functionality working," said Singh in an email to Next Reality. "One player sets up the stage by pointing their phone at any flat surface (streets, tables, etc. ), the stage automatically adjusts for smaller surfaces, and then the second person points their own phone at the same surface and joins in. They both just need to have the app on their devices. Each selects their fighter and then begins the matchup." While Singh confirms that he would like to release this game on the App Store, he first needs to "see if there are any copyright issues." In other words, don't hold your breath. This is a great example of what's possible, but you may never get to play this version of the arcade classic. Nevertheless, as a fan of the NES-era of gaming, I do look forward to seeing even more 8-bit gaming reboots in AR. Perhaps we could get a location-based revision of Final Fantasy next?